Bethesda is teasing something that looks an awful lot like a reveal for Wolfenstein: Youngblood. The official Wolfenstein Twitter account posted a tweet earlier today which could point to a reveal in the not too-distant future. That tweet, which you can check out towards the bottom of this article, shows a close-up of series protagonist BJ Blazkowicz’s face, overlayed with the text “location: unknown.” That speaks to the overall premise of Wolfenstein: Youngblood, which will see players take on the role of BJ’s twin daughters, Jess and Soph, as they journey to Paris to search for their missing father. A trailer for the game, which was announced at E3 2018, reveals that it’ll be set in 1980, when the girls are in their late teens and BJ himself is in his late 60s. Aside the inclusion of the power armour that’s featured elsewhere in the series, details are pretty sparse, but given the timing of this teaser, I imagine we’re going to be learning more about Youngblood pretty soon. PAX East, after all, is just around the corner, and it’s perfectly possible that Bethesda is planning to offer a first look at the conference later this week. Youngblood has already been in the news recently, as Bethesda confirmed that it would launch on Steam as well as the Bethesda launcher. A similar fate will befall Rage 2 and Doom Eternal, while Fallout 76 will also be making the move. 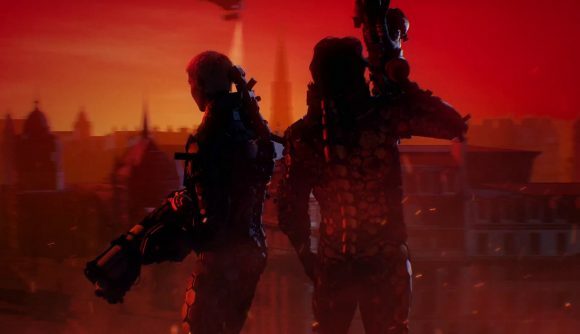 It’s likely that Youngblood will be similar in scope to Wolfenstein spin-off The Old Blood, rather than another full-scale entry in the series. If you’re hankering for more, however, Bethesda VP Pete Hines says that the company is “absolutely making a Wolfenstein 3,” suggesting that BJ will eventually be back in some form or another.